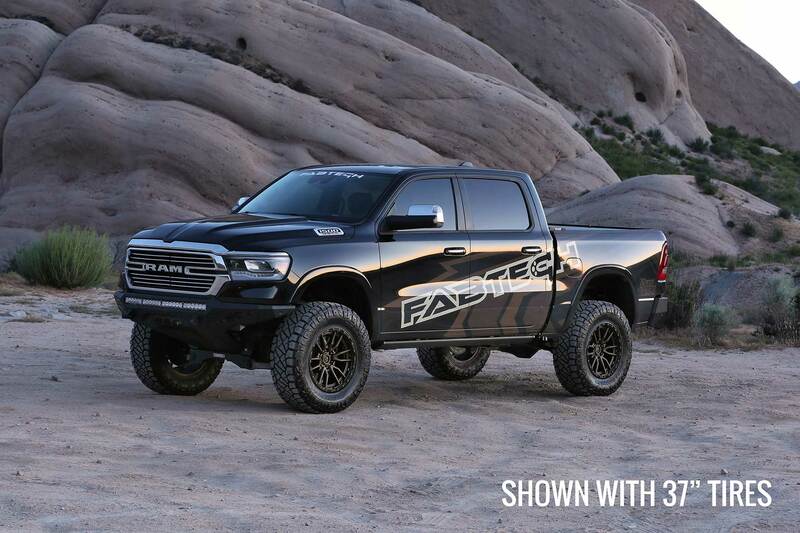 This system is a great choice for Ram owners looking to keep that stock ride yet want big tires and wheels. The factory suspension is relocated with heavy duty bolt on bracketry that will provide years of trouble free service. The system features Fabtech’s proven IFS technology with extended length ductile iron steering knuckles for proper factory electronic stability control functionality. 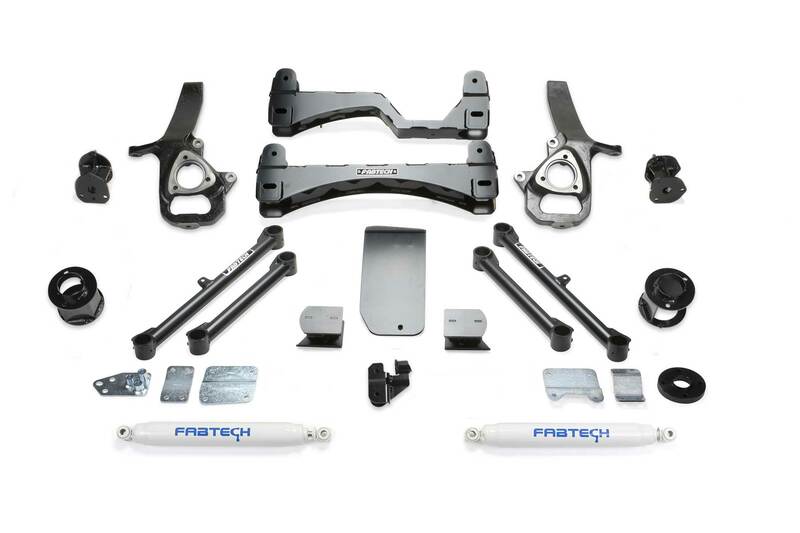 Heavy duty 1/4" thick steel lower control arm crossmembers provide superior ground clearance while the integrated front differential skid plate adds protection to the drivetrain. 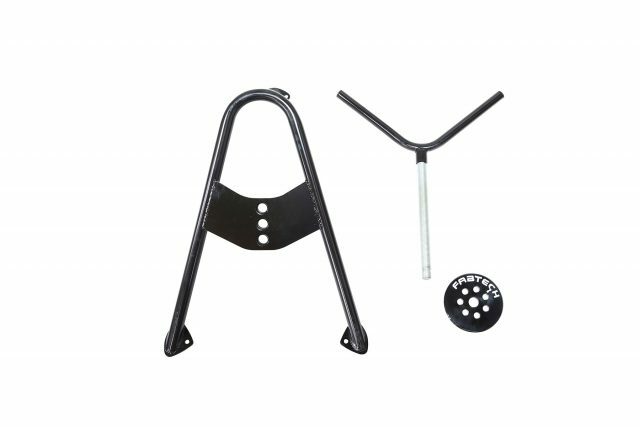 Rear lift is accomplished with steel coil spring spacers that utilize the factory coil springs for stock load carrying capacity with a great highway ride. 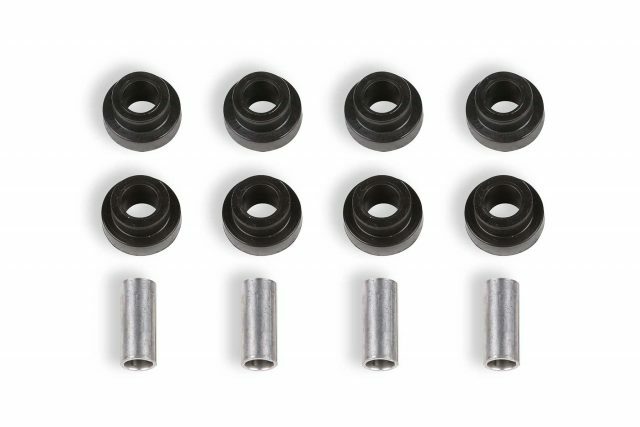 The Basic System includes front coilover spacers that utilize the factory Coilover shocks for a stock like ride characteristic. Rear shock options include Performance twin tube or Stealth monotube shocks. 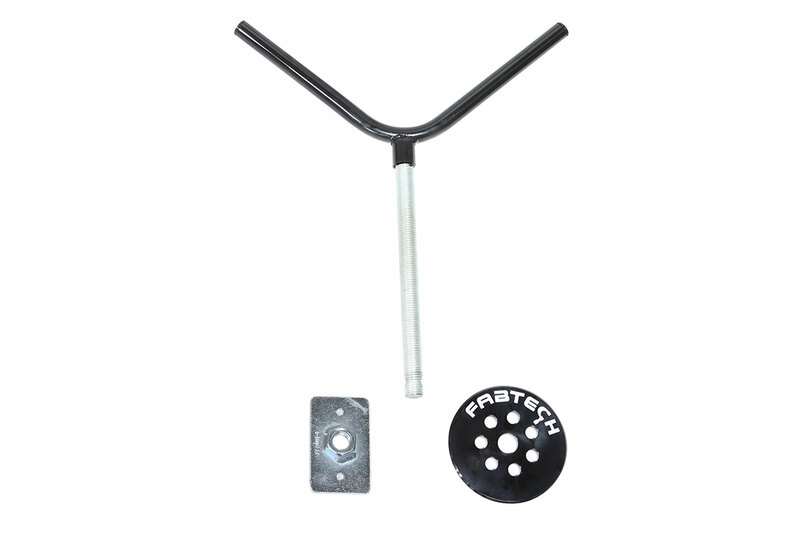 1/4" thick steel lower control arm crossmembers are arched for maximum ground clearance. 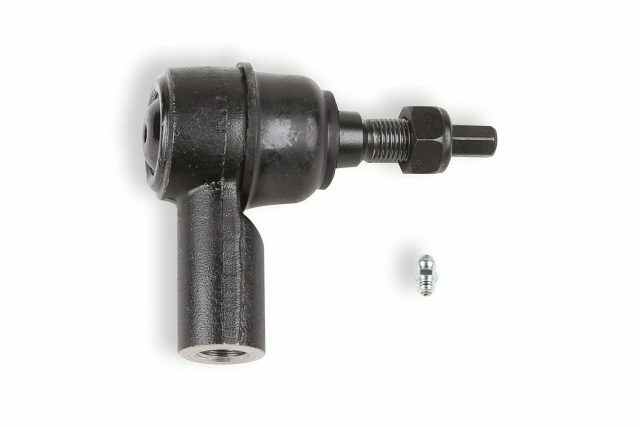 Four adjustable alignment cams provide a wide range of adjustment. The fully welded box design of these crossmembers provides additional strength to the front suspension. Extended length ductile iron steering knuckles retain near stock track width keeping the tires under the fenders. 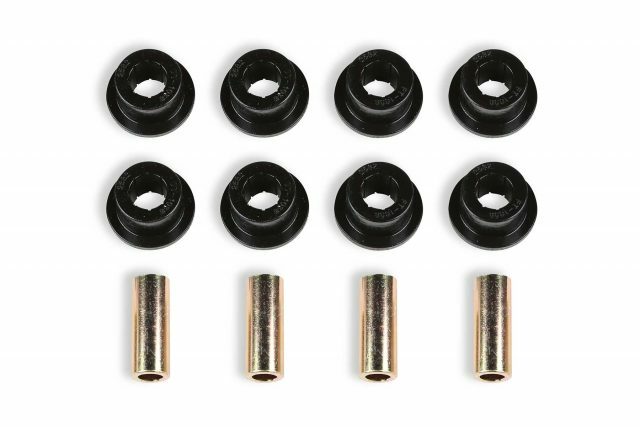 These steering knuckles are designed to work in conjunction with the factory ESC for proper functionality at all speeds. Thick wall tubing and 1/4" thick steel is used to build these 6" lift spacers retaining the factory Coilover shocks for a stock ride. Integrated differential mounts on the crossmembers properly reposition the front diff for the precise CV and driveshaft angle throughout the entire steering and suspension travel range. Heavy duty drop brackets retain the factory link ends at the correct angle for a positive road feel without creating binding at full droop. Steel rear spring spacers utilize the factory coil springs retaining the stock load carrying capacity and ride comfort. The bolt on relocation bracket re-centers the rear axle for the new ride height while retaining the factory roll center of the vehicle. 196. Must use aftermarket 20″ wheels or larger. 200. Does not fit Rebel models. 201. Does not fit vehicles equipped with OEM 22" wheel, and heavy duty bearing option. 203. 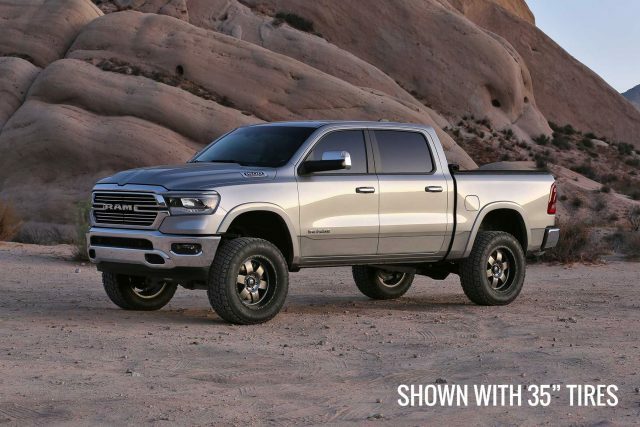 Does not fit 2019 Ram 1500 classic models.